When it comes to taxes, there are so many misconceptions. It’s easy to get confused and end up in hot water with the IRS. This is easy to do if you blindly follow someone’s bad advice. When it comes to the IRS, it’s important to make sure you’re educated and get help when you need it. 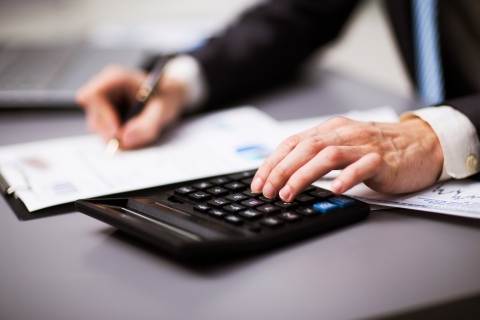 At Laird’s Tax and Accounting, we have a staff of highly trained tax preparers and are passionate about saving you money whenever and wherever we can. 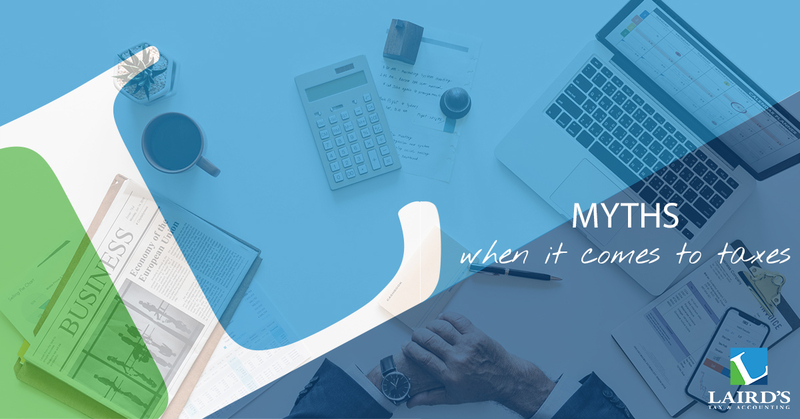 In this blog, we’re sharing some of the most common myths when it comes to taxes, so that you can avoid ending up on the IRS’ radar. Myth 1: Filing taxes is voluntary. This might seem obvious, but there are a number of people who believe this as true. This is because the Form 1040 instruction book describes the tax system as “voluntary”. This refers to the fact that each individual is responsible for determining the correct amount of tax they owe, and has no relation to whether or not filing taxes is an option. Unless you have a legitimate dispute, contesting the payment or filing of your taxes is not a good idea. Myth 2: People who file electronically are more likely to be audited. The truth is, the majority of returns are now filed electronically. Because this is new, people have begun to worry about the new system being prone to more audits. The IRS audit rate remains steady at less than two percent of all returns. The primary triggers for audit remain the same: filing late, high self-employment income, and math errors. Myth 3: Students don’t have to file a tax return. The IRS doesn’t care about the educational status of citizens. What the IRS cares about is income. If students have more than $10,400 in income or $400 in self-employment income, they need to be filing. Even if working students earn less than the filing minimum, it’s a good idea for them to file because a refund could be due. If you are a student, keep in mind that if you are under 24 and make less than the minimum filing requirement, you can be claimed under your parents’ taxes, and should file with your parents. Myth 4: Filing an extension puts off payments. If money is owed to the government, it still needs to be paid by April 17 to avoid costly penalties. The failure-to-pay penalty is half of one percent of the money owed, which applies each month beginning on April 18. If you file for an extension, there’s no stigma. The government doesn’t ask for a reason, simply the proper filing and at least 90 percent of the money owed. When the full return is filed, anything still owed to the government must be paid. Myth 5: If I don’t hear from the IRS by the end of the year, I won’t be audited. The IRS has three years to audit taxes. So, the ones filed in 2019 may not be audited until 2022. If an audit does come, it will be in letter form. Any other form is a scam, and it’s important to be wary of tax scams. Myth 6: Once I receive my refund I’m safe from audit. All a refund means is that the IRS has reviewed your tax return and agreed with your calculations. Deciding who they audit is another process entirely, and determined long after you get your refund check. After your refund is paid, the IRS sends your return through a computer check that compares it to a computer model. It is then given a score based on certain factors. For example, one of the factors could be the average amount of charitable deductions claimed by a person earning the same salary as you. If your return receives a high score, an agent reviews it and those with the greatest potential of yielding more taxes, interest, or penalties are audited. Myth 7: A large refund is a good refund. Anyone would rather receive a check than write one, but letting the government use your money interest free, just so you can get a larger refund isn’t a wise financial decision. Your objective with tax refunds should be to regulate your withholding exemptions, the amount of tax you pay during the year, so you stay more or less even with the government. No one wants to owe a lot or suffer a penalty for not paying enough of your tax obligation. A large tax refund is a sign that you paid too much over the year, and that extra money would be better off in a savings account where it can earn interest. Myth 8: If I am due for a refund, the IRS will email me. The IRS NEVER initiates taxpayer communications through email or anything other than a formal letter. If you receive an unsolicited email appearing to be from the IRS, it may be part of a scheme. IRS schemes lead to identity theft. In order to protect yourself from identity theft, in emails that claim they’re from the IRS, don’t open any attachments or click on any links. Get ready for tax season before April rolls around, and invest in the help of a tax professional. At Laird’s Tax and Accounting, we help our clients plan their spending investments throughout the year and strategize their spending and tax liability through our tax services. We also help them with tax preparation. Contact us today to learn more about how we can help you this tax season.